Before proceeding with the purchase order, we recommend you to choose the measure of your hand with precision. 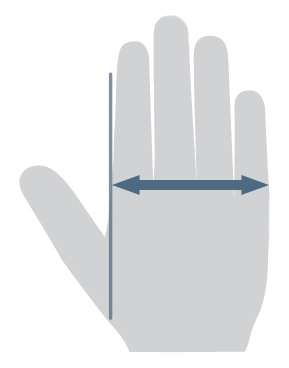 The width of your hand must be measured, with your hand open and your fingers side-­by-­side, at the base of the fingers (forefinger-­little finger). In case your measure is on the limit or near the limit between two sizes, choose the smaller one. SAFE SERVERS WITH TRANSACTIONS 128 BIT ENCRYPTED THANKS TO PROTECTION PROVIDED BY PAYPAL.